A website delivers information to its users regarding products or services that they want to purchase. They can also have the information about some issues that interest them. When it comes to setting up a business, a well-designed website is now integral to driving target customers, promoting a business, and building a brand identity. In today’s highly competitive world of business, every company wishes to put its products or services on the Internet. Then, some institutions want to spread awareness through giving out details regarding an issue. They also need websites to reach out to masses. So, a site is a primary tool in the modern world to do business and provide information. However, as far as doing business is concerned, any casually designed website is simply not going to work. This is because the users have many sites as options to visit. If a website is not designed well, it fails to give a pleasant experience to its users. Therefore, only a user-friendly website will keep the visitors glued to the site pages and the information. If a user finds navigating through the pages a complex and unengaging exercise, the site will suffer as the user will migrate to the other well-designed sites. So, we can say that a website must be nicely designed for its target audience. Only such a site can help in building your online presence. In fact, a website works in many ways for your business. You need a great thought of website design basically to make your visitors navigate through the pages easily when they look for information. You have put many products or services on your several web pages. But to access them quickly from one page makes your website useful for them. A chaotic website with many confusing elements and clutter will compel the user to leave the pages immediately. Remember that people’s and your customers’ attention span is very short. You have to keep them engage with your web pages and information immediately s they visit the site. With a professionally designed website, you can win the trust of your customers. They take such a site as a sign of a serious business. You make a good impression on them whey the click on your site link and visit the pages. Also, note that humans love to communicate through visuals and website is one such visual that you can design strategically to impress the visitors. If your website appears to the users as shabby, they will leave it only to visit your competitors’ sites. So, a poorly designed website will do more harm to your business as you will lose customers. But if you have invested your time and money to create a unique web page design, you can set yourself apart from your competitors. Since most businesses have access to the same areas, customers and other resources, a strategically crafted website can help you stand out from the competition. When people visit your website, they look for brand consistency. This means if your web pages have different fonts, colors, and other elements, they will have less trust in your business and they will leave to explore any next option. But an experienced web designer will ensure consistency of design elements so that people can take every web page and the entire site as yours. This also helps in minimizing distractions on your web pages. Another reason why your business should have a well-designed website is related to search engine optimization. This implies that your web pages should be visible to the users right away at the top of the search results when they type some keywords to locate your products or services. If your website is ill-designed, its chances of appearing at the top search result pages are minimal. Moreover, even if the site is on the top pages, it may take time to load, which irritates to the users. A professionally created website has its on-page SEO basics in place so that the search engine can crawl the pages. Even if you create a social media page, it should be SEO-friendly for your business promotion. Investing in well-planned website design is a wise decision. It will help your business grow in many ways. Not only such a site will drive customers, but it will also be a way to build its brand identity. But you should be aware of the key design elements that make a website a user-friendly place. Navigation is an essential feature of any website when users want to visit different pages to access information. A typical business website has many pages. For a user, it is not easy to manually go to each page from a difficult route. But developed and modern navigation helps users explore the entire site with ease from one page. But the navigational system should need not to be exciting and state of the art. All you should ask your graphic designer for the website is to create simple but unique and intuitive navigation. A website is first a visual medium. This means that a user sees the things on a web page to get an impression of a business. But what elements make this visual platform? Mostly, websites have typefaces, colors, and images as the main three elements. Then, some sites have videos and infographics, and others as well depending on the requirement of a business and web design trends. Typography is a key element of a well-designed website. The customers can identify a business from its competitors by seeing the fonts. As per the new trend, the designers are using large fonts to draw the attention. A good website can give subtle hints about what your company does and what it stands for. So, just by using a typeface, you can convey if your business is formal or informal for the users. Colors express emotions. A smart web designer knows how to evoke some desired emotions using colors. But make sure that the colors on your website are just right to convey your message by evoking the right set of emotions. For example, a red color signals that the company and business are in something exciting and passionate. Fast food companies usually have red on their websites and even logo design as it expresses youthful energy and passion. When choosing a typeface and color for your website design, it is essential to consider your brand message and brand personality. Your users and customers must get your message of business by looking at these elements. However, avoid excessive use of typeface and colors as the emphasis should be to create a simple site. A cluttered page does not look nice. It confuses the users and customers. So, keep the pages clean and simple. Many websites play videos that play in the background. They are efficient visual to tell a story of how a brand was conceived and developed. Such videos can even replace the need for a more substantial amount of text-based content. When visiting such websites, you view a video that automatically plays in the background. When you hire graphic design services to create your website, discuss the prospects of including some videos to engage your visitors. One of the best use of the videos is for engaging the visitors with your business. The visitor can quickly know the key points of your business, company, and products without reading any lengthy text. Note that videos are processed thousands of times quicker by our brains as compared to text. Flat design has been a key element of most website designs for last many years. It is a type of design that avoids giving any perception of being a three-dimensional design. For example, shadows are avoided in such a design. Flat designs are simple for the users to understand. It also helps a website load quickly as there are no technical elements involved. However, some designers now use a subtle hint of dimensions and shadows. So, the flat design has now turned into a semi-flat design, that most websites now use. Semi-flat design lets your visitors grasp content instantly, and some elements of depth are included to bring the design to life. You can use this design element in creating your home page and product pages. If your website sells products or it is a B2B website, then incorporating big product images are key good web design ideas. The site owners use these images to showcase different features of a product. This gives the buyers a sense of the usefulness of the product. Typically, there is a giant image of a product at the top of such a website. When you scroll down, you find many other images of the same products that show its different features. Many such images are responsive for better user experience. Card designs are also among the most sought-after elements of a well-designed website. Many sites such as Pinterest are solely based on card designs. This helps distribute and show information in a visual manner to the users so that they can get the content in small bite-sized pieces. They are not overwhelmed by the content when they visit a web page. The users can also choose the content from the card and expend it for further reading. This design also keeps your homepage organized and clean. Give a thought to card design when you explore different graphic design ideas for your website. 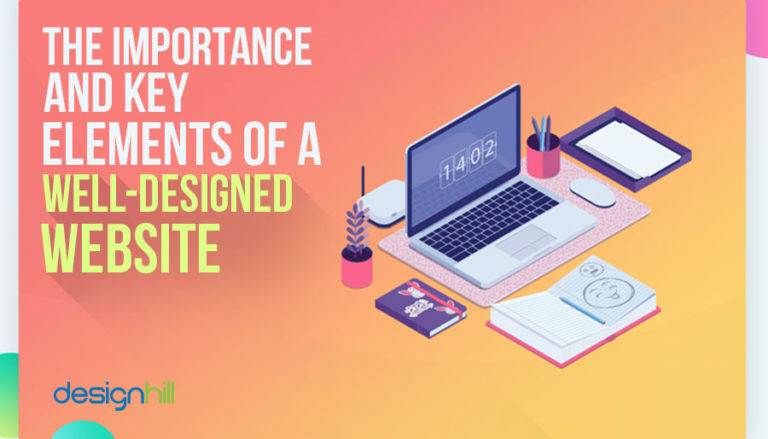 So, these are some of the basics to understand the importance of a well-designed website and the elements required to design to make it user-friendly. It is clear that the site is a visual medium that involves careful selection of colors, typefaces, etc elements. If you want a professionally designed website for your small business, Designhill can help. This leading marketplace is home to hundreds of designers whom you can lure through your design contest to create a website for your company. A well-designed website is the key to doing business in the modern digital world. Your website is a source of information to users who look for products or services you sell. But the site pages should make a desirable impression to convert the visitors into loyal customers. So, you need to use elements like typefaces, colors, space, flat design, card design, etc. to create a website for your brand message.